Twitter is the popular micro-blogging website that lets users share 140 characters short messages with their followers. Twitter is also expanding with the launch of new features monthly. Now it supports photos and photo tagging. Initially, it was only for text tweets. Recently it also added various nice features to make it more interesting. If you are addicted to Twitter, this article is for you. 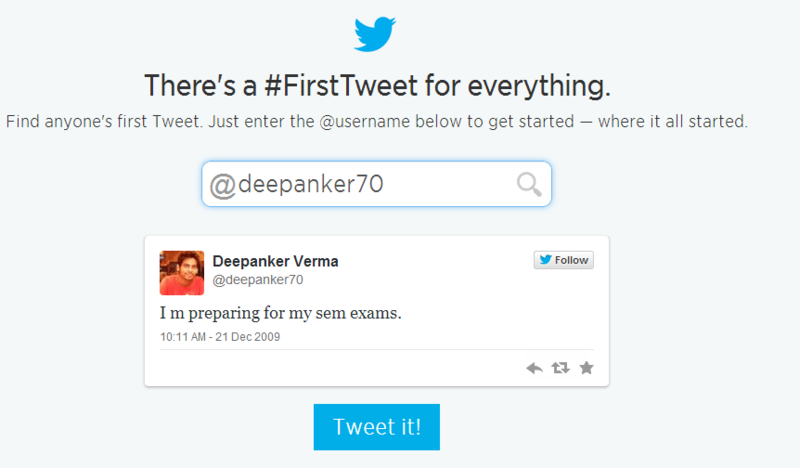 A few days back, Twitter has also added a tool that lets users find the first tweet of any Twitter account. This tool is really interesting because there are very few people who can really guess their first tweet. Do you remember your very first tweet? Just visit Discover your first tweet page and enter the twitter username in the text box. I tried to find out my first tweet and saw that I first tweeted on December 21, 2009. You can enter the username of any Twitter user to find out his/her first tweet. Find your tweet and share with us via comments.